An expansion for the village of Shor's Stone. Hana - Blank inn sign resource used to create The Tapped Vein's sign. Shor's Stone always seemed like a place that had more potential than what was in the game, and as it turns out, that's because it does. NPCs talk about Odfel's wrecked house and the need to build a new one, but the wreckage doesn't exist. Grelka has some scenes with the other NPCs that can never play because she never comes to the town, and may well have originally been planned for there. 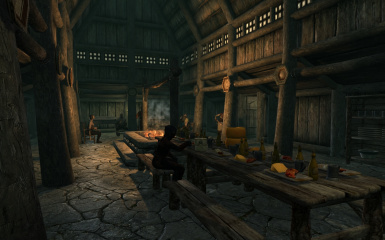 Plus the place always seemed a bit empty, in need of somewhere for the folks to gather at night other than just the fireplace in front of Sylgja's house. Now, all of these things have been taken care of. Shor's Stone is no longer a backwater half-village. * Grelka now has a home at the south end of town. She will travel between there and Riften by horse at the appropriate times. * The Tapped Vein, the inn, where folks gather for the town's evening meal. A subtle tribute to Elder Scrolls Online and the village's past association with Ebony mining. * Inn has a properly working innkeeper, server, and bard. 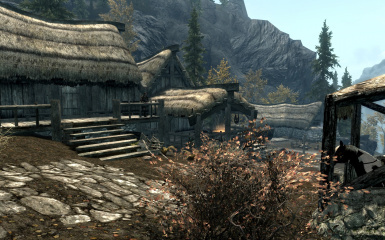 * Odfel's wrecked house now exists on the north side of town. So sad. 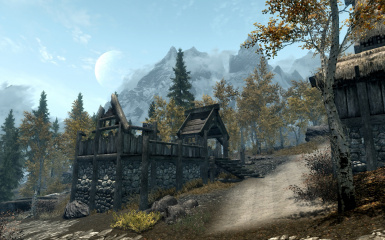 * LOD has been generated for the area, including trees that account for the changes. Drop the Shor's Stone.esp, Shor's Stone.bsa, and Shor's Stone - Textures.bsa files into your Data folder. 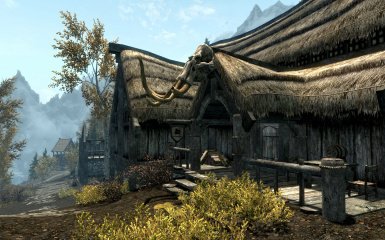 To remove the mod: Make sure Grelka has gone to Riften, or is at least OUTSIDE her new house, and that all the other NPCs are NOT inside the inn. Then delete the Shor's Stone.esp, Shor's Stone.bsa, and Shor's Stone - Textures.bsa files from your Data folder and reload your game as usual. Place with other village mods of similar type. Will not be compatible with other mods that change the layout or add things to Shor's Stone. Grelka may become distracted on her trips to and from the village. Skyrim AI for traveling is wonky at best, and I've done as much as I can to smooth things over. She has been marked as protected to prevent being accidentally killed by the various hostiles along her travel route.